Designed as a useful reference tool to help students, educators, and diplomats maneuver through scholarly literature as well as primary sources published in English between 1989 and 1994, this work seeks to help the researcher make sense of the explosion of literature on this often contentious topic. 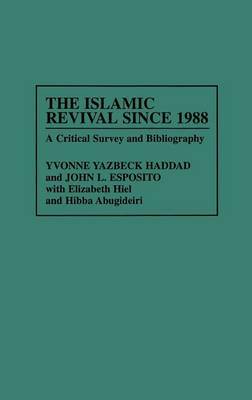 In addition to surveying the literature on Islamic revival worldwide, it provides commentary on literature pertaining to important topics such as the role of women in Islam, Islamic economics, and the migration of Muslims to western Europe and North America. This work is a continuation of the first edition published by Greenwood in 1991, ^IThe Contemporary Islamic Revival^R. Governments, policymakers, and experts around the world are debating whether contemporary Islamic revival, in particular Islamic Fundamentalism, is a diverse and multifaceted phenomenon or a uniformly clear and present danger to be consistently and persistently repressed or eradicated. Some propose that there are means of cooperation, collaboration, or co-optation with those who adhere to it, while others see it as a menace, warning of a clash of civilizations, and of an Islamic population explosion which poses a demographic threat to national security and world peace.